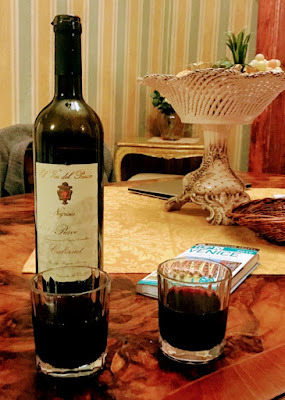 The family that own this small palace by the canal, between Rialto and San Marco, owns its own vineyard on the banks of the River Piave, just outside Venice, where they have been producing their own fine DOC wines since 1925. Since then, they continue to use the traditional production process taught by Ruggero. The careful produced portfolio and the very limited number of bottles produced in the vineyard guarantee the craft quality of these wines. In this ‘private cellar’ here is a collection of typical Italian wines, including famous reds such as Merlot Piave DOC and Cabernet Piave DOC, as well as their own peculiar Cabernet Spumante. All of these wines, as well as the Prosecco, have received several awards in national and international competitions. The ‘private cellar’ in this apartment contains 14 bottles of fine wine, five bottles of Spumante and three of Prosecco, and they range in price from €6 to €8. The Cabernet Piave DOC, which we shared last night, has a deep ruby red colour tending towards purple, and with ageing takes on garnet undertones. It has good body and is typically dry and well-balanced. The other wines in our ‘private cellar’ are Merlot Piave DOC, Pinot Grigio IGP, Rosé Manzoni 2.15 IGP, Brut Spumante Extra Dry and Prosecco DOC. I may even bring a few bottles home with me on Friday. I am in Venice for a few days, having arrived in Treviso yesterday [5 November 2018] on a Ryanair flight from Dublin. I am staying at the Palazzetto San Lio in the heart of Venice, between the Rialto Bridge and Saint Mark’s Square. 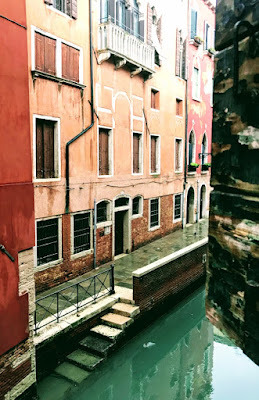 It is at the end Calle del Frutariol in the sestiere or district of Castello, and just a stone’s throw from Rialto and the Grand Canal. Palazzetto San Lio is a splendid Venetian palace built in the 17th and 18th centuries. It is owned by an old Venetian family which for generations has been committed to keeping alive the traditional splendour of the palace and its Venetian style. 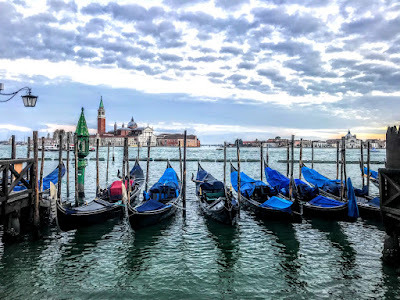 All the apartments have canal views, and are furnished with Venetian antique furniture, Murano chandeliers and upholstered walls in the grand Venetian style. The careful restoration of the building’s exterior last year has given new life to the external façades, while maintaining the original architectural features. The sestiere di Castello is in the eastern part of Venice, known as the ‘tail of the fish’ because of its shape, and overlooks the Grand Canal. It is the largest district in size in Venice, and the second in terms the population. 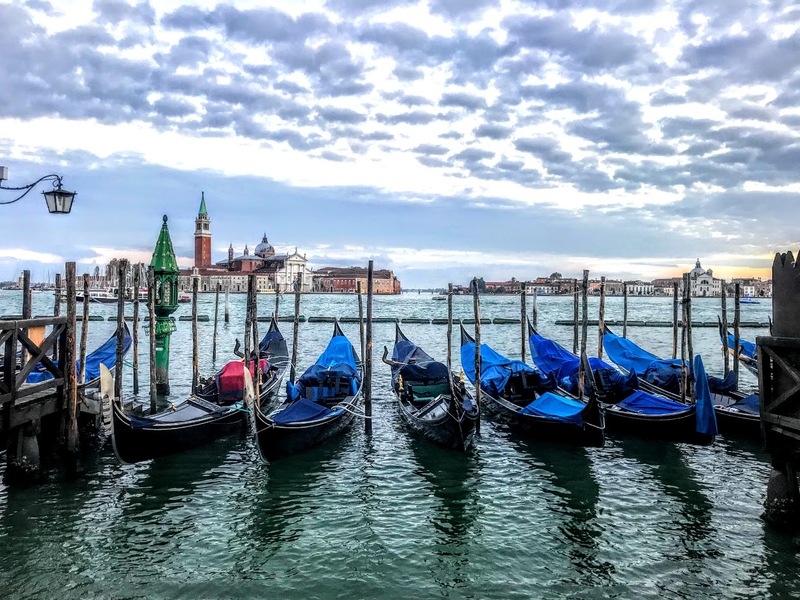 It was one of the first residential areas in Venice, and its name comes from a mediaeval fort that stood in the area of the island of San Pietro. This is also one of the greenest areas of Venice. It includes the Gardens and the park of Sant’Elena, and in many parts of it are tranquil, away from the main flow of tourists, making this a favourite area for the residents of Venice. Wandering around as darkness was about to close in yesterday, I realised that this promises to be a central location, allowing me to reach all the major sites in a short time on foot. This area also has a promising choice of restaurants, small cafés, pastry shops and shops. We strolled from Rialto to San Marco, marvelling once again at the basilica, the tower, the square and the Palazzo Ducale or Doge’s Palace, watching the gondolas bobbing up and down in the water with San Giorgio Maggiore on the opposite side, as we crossed the Bridge of Sighs, and continued on along Riva degli Schiavoni, past Santa Maria della Pieta, the church where Vivaldi was first recognised as a composer, stopping for coffee before we reached Arsenale. There are several places of interest and historical-cultural importance of this lively sestiere, including the imposing Arsenale, the venue for the Venice Biennale, with its exhibition venues, gardens and pavilions, churches, cathedrals, the Palazzo Querini Stampalia, and unusual Libreria Acqua Alta. Although I was in Italy twice last year , visiting Rome and the Vatican in January, and Bologna, Ravenna, Rimini and San Marino in November, it is ten years or more since I was last in Venice. Last week’s high waters that flooded Saint Mark’s Square seem to have abated, so join me this week as I find explore Venice through the canals, the bridges, and the side streets.